RailTourGuide are delighted to bring you to India and show you around this amazing country on The Golden Triangle Experience! Why not experience a taste of India on this outstanding introductory tour of the country’s most fabled sights. Exploring the Golden Triangle, this journey combines travelling from the India’s capital city Delhi to the wondrous sites of the Mughal capital of Agra, the legendary Fatehpur Sikri and the Pink City of Jaipur. Embark on your journey to India with an overnight flight to Delhi, the flights are NOT included in this itinerary sold from RailTourGuide. Arrive in Delhi. Following customs, immigration formalities and baggage collection, our RailTourGuide representative will meet you as you exit the arrival terminal building, after which you will be transferred to your hotel for 2 nights stay. The Hotel Check-in time is 14:00 hours. Rest of the day is at leisure to unwind and relax in the comforts of your hotel. Enjoy a leisurely breakfast and proceed on a guided tour of Old Delhi and New Delhi. In Old Delhi, drive past the Red Fort; visit Raj Ghat, the simple but moving memorial to Mahatma Gandhi and Jama Masjid, one of the largest mosques in Asia. A short walk in the narrow bylanes is full of legends and unfolds many historic tales of Shajahanbad. See the quaint shops with incredible wares from food stalls to jewelry. Visitors are required to take their shoes off before entering Jama Masjid. Shorts, sleeveless tops, revealing clothes are not allowed inside Jama Masjid. Later in the afternoon, get ready to explore imperial Delhi. Drive past the imposing India Gate (War Memorial Arch), Parliament buildings and Rashtrapati Bhawan (the President’s residence). End the tour with a visit to UNESCO World Heritage listed tomb of Emperor Humayun. The tomb was the first garden tomb in the Indian subcontinent, a wonderful example of early Mughal architecture. After the buffet breakfast, drive to the Mughal city of Agra (205 Kms / approx. 5 hours). 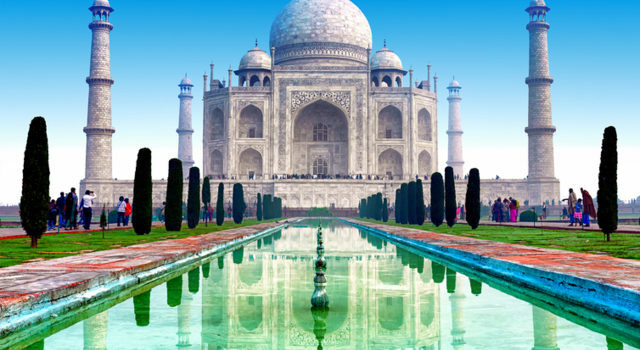 On arrival in Agra, check into your hotel for a stay of 1 night. Afternoon enjoy a guided tour of Agra which includes a visit to the Taj Mahal (closed on Friday), built by Emperor Shah Jahan in the 17th century as a mausoleum for his wife Mumtaz Mahal, a masterpiece in marble and one of the world’s most famous landmarks. Visit to Agra Fort: Proceed on a guided tour of the red sandstone Agra Fort, an outstanding example of Mughal architecture and the seat and the stronghold of the Mughal Empire under successive generations. Visit its Hall of Public Audience and Royal Pavilions. After breakfast, proceed for a tour of the fabulous hilltop citadel of Amber Fort, en route taking a photo-stop at Hawa Mahal, a five-storied wonder with a spectacular pyramidal facade. Located at the top of a hill, Amber Fort offers spectacular view of the old town below, where Akbar stopped en route on his annual pilgrimage to Ajmer. Enjoy a leisurely breakfast at the hotel. Check-out and proceed on your drive to Delhi (260 Kms / approx. 6 hours) and transfer to the hotel. This morning, you will be transferred to the airport for your onward journey. (B)the flights are NOT included in this itinerary sold from RailTourGuide. Proceed on a guided tour of the red sandstone Agra Fort, an outstanding example of Mughal architecture and the seat and the stronghold of the Mughal Empire under successive generations. Visit its Hall of Public Audience and Royal Pavilions. This evening, discover the dynamic cuisine of Rajasthan as you visit a local family. Witness the play of spices and flavors at a cooking demonstration by a culinary expert. Dishes like Dal Bhati Churma (traditional pulses and bread), Laal Maas (mutton dish), Bhoondo raita and pulao (rice dish) are some of the delectable items that may be prepared. Observe the distinct cooking style, method and ingredients used. Learn the properties of every spice and the role it plays in producing the desired taste. Later, savor a perfect Rajasthani meal with your host. Explore the walled city of Jaipur which has an interesting history to learn about. The Maharaja of Jaipur, Maharaja Sawai Jai Singh constructed 20 feet high fortification walls to cover the city from all sides, for security purpose and designed seven entry gates. Wander the streets of the old city and learn the history of Jaipur, its culture, tradition, beliefs and other aspects that make up Jaipur. Enjoy the city tour including a visit to the royal City Palace Museum, which has a superb collection of Rajasthani costumes and armory of Mughals and Rajput kings. Continue to the UNESCO listed awe-inspiring Jantar Mantar, an astronomical observatory built in the 18th century.